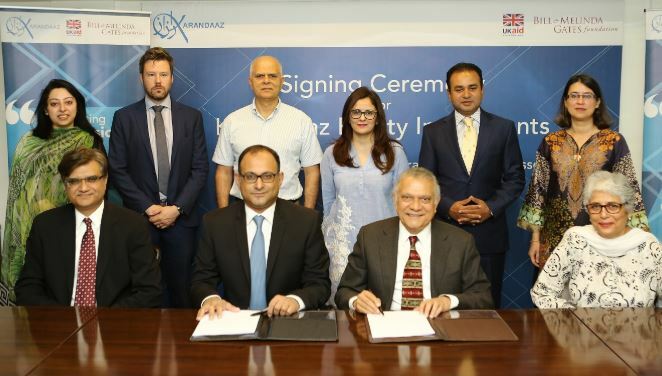 The UK-funded Karandaaz will triple the impact of a leading health diagnostic service provider and set up a unique warehouse for agricultural produce in Punjab. These two investments are expected to create more than 900 new jobs in Pakistan. This was announced today at the signing of two new equity investment deals in Islamabad. The first deal was signed with Excel Labs and will help Excel Labs network expand its service by three times and provide easy access to world-class diagnostic services for millions of Pakistanis. The second deal was signed with an innovative entrant in agriculture sector. Through this investment, Punjab will have its first state-of-the-art controlled atmosphere warehouse, benefitting the farmers through better off-season prices and reducing post-harvest losses in agriculture value chains. Karandaaz’s latest equity investments will allow both these high-growth businesses to expand their operations and create more jobs, and economic activity in the health and agriculture sectors. These equity investments are collectively expected to result in almost 900 new jobs out of which 200 will be for women and more than half will be for youth. These investments will also catalyze growth in these two high-potential sectors, generating further benefits at the macro level. Karandaaz Pakistan promotes access to finance for micro, small, and medium -sized businesses through commercially directed investments and financial inclusion for individuals through promotion of digital financial services. It also develops and disseminates evidence based insights, and encourages innovation in financial space. Karandaaz has financial and institutional support from the United Kingdom’s Department for International Development (DFID) and the Bill & Melinda Gates Foundation.